"Abby", pictured here nearing the completion of her championship, is another Northwoods "Future Star". She has that perfect combination of mischief, intelligence, birdiness and intensity. Once she figured out the "show dawg-thang", Abby breezed thru her championship, earning 10 points in 4 consecutive shows, including a 5-point major specialty win! Not much one for just standing still (what can I say, weimaraners are smart! ), Abby caught many a judge's attention with her floating, eye-catching movement. 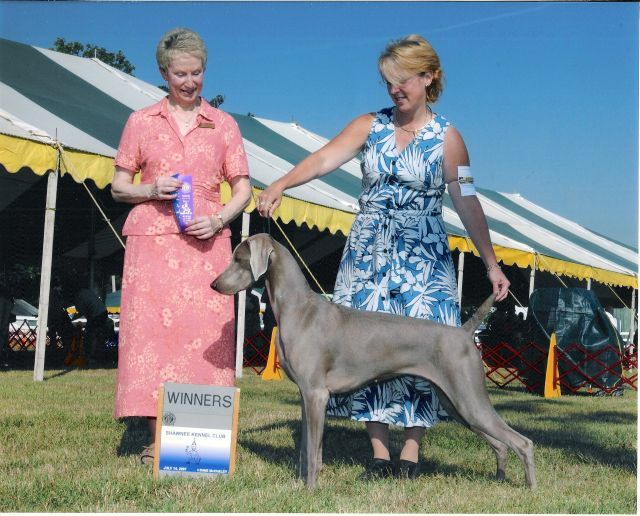 Abby was bred by Christie Majors and Heidi Warren, and is owned by Janet and Jim Meyer, Mischief Weimaraners, Pasadena, MD. Here's a picture of Abby when she was just 15 weeks old, and learning to be a show dog.